Beaver Folk Dancing is strongly in favor of using live music whenever possible. Here are of few of the ways that we try to accomplish that goal. 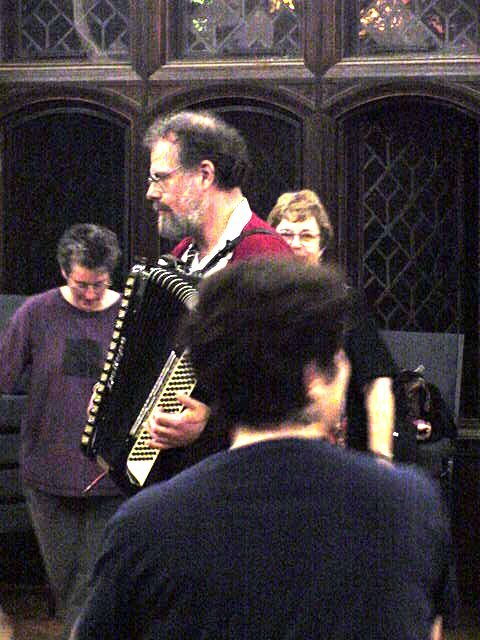 John Matulis is our once-a-month accordionist. John can play just about anything from a Bulgarian ručenica to "Lady of Spain"! He has played for our group on the second Wednesday of most months since the 80s. Amazing repertoire, . International Folk Sounds (affectionately known as "the IFS") is a band composed of Susan Anderson (balalaika, tambura, fiddle, gaida, guitar, keyboard), Daryl Kezell (accordion, tambura, tambourine), Connie Martorano (mandolin, bouzouki, guitar) Bill Wadlinger (mandolin, guitar, tambura, charango), Bob Bratton (bass guitar, tupan), and Carol Wadlinger (flute, tambourine). They play at various folk dance events around town and beyond including occasional appearances at Beaver Folk Dancing, and have just released their second studio recording, Foot Fire, featuring 21 well known international dance tunes. They also lead our open orchestras (see below). John Matulis (see above) leads ZIMA, which occasionally provides music for our group. Don't let the sombreros in this picture fool you! Ever want to play in a folk band? Four or five times a year, Beaver Folk Dancing sponsors an "open orchestra." All musicians are invited to come and play for international folk dancing. Sue Anderson, with the IFS, organizes the musicians and provides printed music and leadership. A great way to get accustomed to the music for the open orchestras is to come to the international jams that meet the third Monday monthly Sue Anderson's house in Wayne, PA. (Note that it no longer meets at the Belmont School). Bring your instrument and play with us! Click here for the "official" jam website or click here for our own description of the jam including the valuable "what you really want to know" info. These pages will also lead you to downloadable music that you can print out for practice, and in many cases midi files that will help you hear what the tune sounds like--especially helpful with some of those cool Balkan rhythms.